Here is a picture of a tree alongside our house that we think is absolutely beautiful in the spring. This picture is from last year...April 14, 2011. Jeremy took a picture of this tree just on Thursday. It is on his iPad (which I don't really know how to use) so I pulled this from my computer archives. But this is exactly what the tree looks like right now. We are about four weeks ahead of last year! This has been such a mild winter for us here in WV and I admit, I have missed the snow. I also will admit my ignorance with most things green. I believe this is a weeping cherry tree. Again, I'm not certain but I did Google it! I told Jeremy that if we were not going to have a real winter, then I am ready for our beautiful warm weather. Jeremy also did something he said he would NEVER do.....he cut the grass in March! We really had to. The grass has grown so much that we were among the few in our neighborhood that continued to "hold out". We have had so much rain that our side yard is "soupy", as Jeremy put it. So that will not get cut until we dry out some. Actually, when we get on a normal grass-cutting schedule, our boys really enjoy cutting the grass, especially Micah. Micah loves to see the lines from the lawn mower in the yard. He takes pride in cutting the grass, and he is only eleven. We have good kids and we are trying to teach them to have a good work ethic and take pride in doing things well. In fact, as Jeremy was cutting the grass on Saturday, Micah was standing on the front porch just dying to be allowed out to cut the grass. The problem is, Micah was sick. This past weekend has been a sick weekend here at the house. All four kids are under the weather. Kyle has been dizzy and has had a queasy tummy. Micah now has a fever, cough, stuffy nose, and his bones hurt (his words not mine). Rebecca says she feels "loopy" and tired. Ben has a cold, which is never just a cold with a child who has severe asthma. Friday a sweet friend, who is a plumber, came over to fix the plumbing in our kids' bathroom. We had it remodeled a year and a half ago but the shower was never right. Every time the water was turned on to the tub, water also came out of the showerhead. So, every morning when I would go into the kids' bathroom to rinse my hair (we only have a shower in our bathroom, no tub), my right shoulder was soaked from the shower. We cannot bring Mariah home and give her a bath with the shower running too. Dave came at 9am and left after 7pm! He was frustrated that the previous men took advantage of us and he corrected the problem with new copper pipes! It works beautifully! Then we had invitations to a complimentary dinner at a brand new restaurant, Cheddar's. They invited business people in the community to come for a complimentary meal prior to their opening. They had contacted our church and wanted to give invitations to all the church staff and their families. Since my kids were sick, we called Dave and offered him our invitation. We thought he was going to take it; however, he called back and told us that he and his wife were going to come over to babysit our sick kids so we could go out as a couple. Keep in mind, our family all lives out of state and we only go out on a date once a year....our anniversary. This was so sweet of them. The wait to be seated was 70-80 minutes! We really enjoyed the time together. The food was absolutely delicious! It was a great night! When we came home, Dave and Cathy had the kids down in our theatre room watching Hop. We have never seen it before, but it looked cute. The irony of it was that this family had an older son (20's maybe) and an adopted daughter from China who was maybe ten or eleven. It seems as though adoption is constantly being put before us. We are praying for a healthier week! Kyle has allergy testing on Friday, again. Hopefully we can start him on a path to healthy, comfortable breathing. Ben also visits his endocrinologist on Friday. Dr. Jones is our favorite doctor! He always tells the kids a joke and enjoys our kids. He is a "kid person", he is a dad to six kids and has two grandchildren. He introduced our family to his wife and daughter a few months back when we went to Chick-Fil-A after an appointment with him in Morgantown. He is such a humble man who always makes our entire family feel welcomed (practically honored) to be there. We are still waiting for our LOA from China. Maybe that will come this week too! This weekend was fun for us. As a family, we decided to go shopping for Mariah. Look what I found as we were going to the check out at Old Navy! It is even spelled correctly! I had to get it and it was only $5. Oh, the little things that excite me. Kyle had a teen activity at the mall with the youth group. It is so hard to believe that we have a teenager! Aren't we too young for that? I realized the other day that when Mariah starts Kindergarten, Kyle will begin his senior year of high school. I will be a well-experienced home school mom! We dropped Kyle off at one of the mall entrances of the team he was to join. It just so happened to be.........all girls! There was our timid Kyle with 5 girls on a mission! They were on a team that was not about to lose. The idea behind this Mall Masquerade was for our church youth group (about 35 kids) to look for 7 adults that were in disguise. Not costumes, just disguises. It was fun for them! I, however, was on a mission to shop. Kyle's team tied for first place, they found everyone then headed back to the church for pizza and......honestly, I don't know! He was in the more than capable hands of our new youth pastor and his wife. Kyle loves them and they provide a lot of clean fun! While Kyle had his masquerade we shopped for Mariah's things......clothes. I have NOTHING for her! This was our first shopping trip solely for Mariah. We never thought we would be blessed with a baby in this adoption. We really thought a toddler. But a baby it is, and a baby we love and welcome. Becca and Ben each picked out an outfit for Mariah. Jeremy found a swim suit with lady bugs on it. For those who are not familiar with the adoption world (like us just a few months ago), lady bugs are believed to be a sign of good luck. Red is the good luck color in China. We bought things in 12 month and 18 month sizes. She will be about 19 months when we go to get her, so we are guessing at sizes. 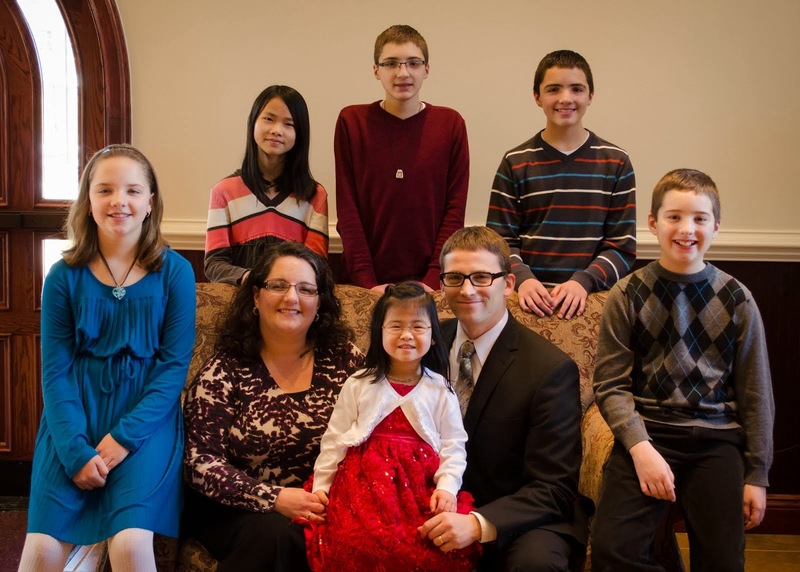 Chinese adoptive children often are smaller than their American counterparts. If I only had that update, we would have a better idea of her size. Although in the winter, their measurements are taken over top of all of their heavy, quilted clothing. So, I'm not sure it would help much. Earlier this week we went to the mailbox and this envelope was among other mail...mostly bills. There was no return address, no letter, and the postmark was from Pittsburgh. So, that pretty much narrowed it down to all of our family and many friends! However, I noticed the handwriting and it took me just a few minutes to recognize who sent us this not-so-anonymous gift. She is a friend from high school and has a family and just wanted to help us bring Mariah home. I was so touched and I'm honored to call her my friend. Her cover was blown due to my uncanny ability to remember weird things, like handwriting. Why do I remember such odd things? Anyhow, this time at least it paid off and I can properly thank her for her generosity. The picture to the right is something that was handed to me as we walked into church this evening. It was in a small gift bag and it was HEAVY!! My kids were so excited to see that I got a gift and couldn't wait for me to open the package. I think the picture might be a little dark but the gift included a jar of coins, mostly quarters....and lots of them! Included in this package was a red magnet of China and the sweetest two page letter and a story about this sweet elderly woman's heart for the people of China. She apologized to me and said she hoped it would help. I was so touched as I read the letter as church began and had to leave for a minute as tears made their way down my cheeks. (If you ever make an adoption journey you will learn that emotions are at an all-time high....just like a pregnancy.) She also included a recent missionary letter of close friends that she and her husband support in China. This woman's love for China began as a child. Her story was so sweet and means more to me than she could possibly imagine. What a memory book Mariah is going to have! I have heard, not from my agency, that the Chinese Adoption Authority was moving offices the past few weeks. Not that anyone in this hemisphere knew, but it certainly explains why there have not been many approvals for families in the past few weeks. Evidently, they do not have access to computers or phones. So while they are moving offices, Mariah waits. Today is our 46th day of waiting for our LOA. It is a difficult wait, but somehow we manage to stay busy. We managed to make a trip to Morgantown to see Kyle's ENT on Wednesday. That appointment created more appointments in the coming weeks...allergy testing again for one! And we have several of Ben's doctor appointments coming up in Morgantown and Cincinnati. Then there are dentist appointments and orthodontist appointments. In a way I'm thankful for these distractions but I hate that Kyle's sinuses are such a mess and that our dear Ben has so much to go through. I love these kids with every ounce of my being! They bring us joy!! But I'll be honest, I cannot wait for school to be over. I have their school year scheduled through the end of April. I think we may need to go another week into May. We have had a very rigorous school year and we only took off a few days for Pap Leard's funeral, two days at Thanksgiving, two weeks at Christmas, and one "snow day". That's it! We began school in mid-August. If I was completely honest, we have had school many Saturdays too. Not that they appreciated that.....especially Ben. Jeremy and I continue to be amazed at how this process has touched not just the lives here in our little house in WV, but also the numerous family and friends that just check in to see how things are going and to let us know they are praying for us and our dear Mariah. I feel like we have become popular at church as so many people just stop us and ask how it is going. WOW! Who knew that Mariah would touch so many lives? We are forever grateful for your love and support for us. I will say thank you but that really doesn't come close to how we feel. Your prayers for us truly mean so much. We do as for continued prayer as we finish this process. As a result of taking a rare Sunday afternoon nap, I am still awake at 2am. But I think I am finally getting sleepy. In closing this blog post, I would like to request prayer for a sweet adoption friend who is struggling. In the process of her adoption, after being matched, her husband got sick and passed away. As she has tried to apply for grants, she is being denied because most grant foundations require you to be married. I am trying to help her with a few grants and I ask for prayer for her as she will be traveling in about 10-12 weeks to get her precious toddler in China. She lost her husband in the summer of 2011 and has two children she plans to take with her to China. The title of my blog post kind of gives it away. To be honest, it has been a difficult few weeks. We have been waiting for an update on our Mariah since the beginning of January. The only paperwork we have on her is missing a lot of general information. The Chinese doctor did not fill in the boxes on her medical form that included her blood pressure, a neuro-check, her skin, her vision, a few other things. I'm not all that worried, but that information would be nice. Today marks day 37 of the wait for our LOA. They say this is the toughest wait. I pray that we are not one of the unfortunate few that wait 130+ days for our LOA. There have been very few LOA's issued for the past two weeks. I am praying for the floodgates to open on Monday or Tuesday and for ours to be included. Today, a very dear friend of mine boarded a plane with her husband and two of her children for a direct flight from Dulles to Beijing. She will be spending the next 20 days in China meeting the two newest members of her family. She has three biological sons, the oldest is fourteen.Their first trip to China was in 2010 and they brought home their first adopted son. She will have five sons and one daughter! I am so excited for her! She has been an adoption mentor to me. She has held my hand and walked me through the process and listened to me cry, complain, and rejoice (yes....probably all in that order). I don't think I would have been able to do it without her. So, thank you Kristin! I'm praying for you and your family. That is the first reason of this week of blessings. Two orphans will be united with their forever family, raised in a Christian home. That is an example of The Great Commission. Personally, I have had a rather blessed week as well. We had sweet friends give us money for our adoption. It was unexpected and very generous. How do you thank someone for helping in such a huge way? I called Lifesong on Monday to see how our fundraising was going along. I was shocked that only 2 weeks into the matching grant fundraiser, we were halfway to our goal of $2,500. I got a few emails this week of others who were sending their check in to Lifesong. I called Lifeline (our agency) on Tuesday to ask a few questions. Let's just say that our local home study agency is requiring us to keep up with our foster parent training. I was not happy. WE ARE NOT FOSTER PARENTS! Unfortunately, we are the only family in WV who is internationally adopting from a Hague country (since 2008). Our agency specializes in foster-to-adopt. Their regulations do not accommodate our adoption, so we have to continue our "education". While I was on the phone with Lifeline, our social worker asked if I had heard from the JSC Foundation. This was one of the grants that we had applied for back in February. She shared with me that they already received a check for $9,200! We are overwhelmed and in awe at how God has continued to provide for us in this process. This frees up a little bit of money to get the house ready. Jeremy's office needs to have a make-over. The back wall will be made into a closet. It is large so half will be shelves for our board games and toys. The other side will be converted to a closet for clothes to be hung and stored. We need a car seat, a toddler bed, sheets, diapers, wipes, baby soaps, clothes, and countless other baby items. We took a huge step completely on faith. We were prepared to use Jeremy retirement, and take out a home equity loan. Now we do not have to dive into those savings or take out a loan. God called us to be faithful. We had our doubts. We ignored the adoption calling for several years. We thought we had all the right reasons. Money was the number one concern. We knew that Ben's health was another factor in our procrastination. Now that we have taken that leap, the rewards are countless and the blessings keep coming. Thank you to everyone who has been a blessing to our family! We sincerely are touched by the generosity of our family and friends. Thank you to those that we asked to provide reference letters. Just when you thought you were done, we had to ask for more. Those letters were instrumental for the grants we have been blessed to receive.